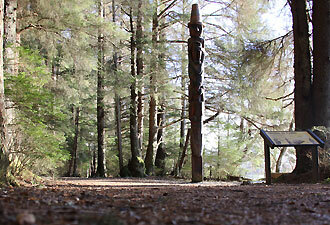 Totem Trail, here viewed by a slug, features totem poles that tell stories, identify clans, and memorialize people. Hi. 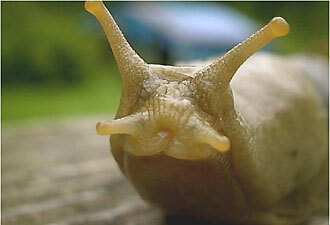 I'm a banana slug. I rock across my home landscape—the 113 acres of Sitka National Historical Park—at .006 mph. This place is hog heaven to me. I'll show you around. But first, let's talk about me. Did you know I'm a loner? I love beer? I hate copper? Hey, I have my own website! There’s even an artificial slug that moves and slimes just like me. It's from MIT, of course. So, let's take a tour. We are Alaska's oldest national park, just ending our centennial year. People flock to Sitka from May to September, drawn by our world-famous collection of totem poles and the Native artist demonstrations at the Southeast Alaska Indian Cultural Center, our visitor center partner. The artists make bracelets and shields, and carve masks and even full-scale totem poles featuring ravens, eagles, salmon, wolves, bears, and beavers. (Alas, no slugs.) In fact, the newest pole will be raised by the community on April 9. It will be big! Follow me down the park's forested Totem Trail. A couple of touring tidbits: Did you know that a local teacher once accidentally burned a totem pole to the ground? Or that the “low man on the totem pole” is good, not bad? Our Trader Legend Pole features a cheat, who is ridiculed in 35 feet of cedar. He's high man on that totem pole. I just love the soft, moist ground. Hey! Watch your step! Sitka National Historical Park was created to preserve the site of the Battle of 1804 between Russian forces and the Tlingit, the Alaska Native tribe that has lived here for literally thousands of years. The park sits in the world's largest temperate rain forest, with Indian River running through to the Pacific Ocean. We have lots of rain—sometimes more than 100 inches in a year. We also have hemlock and Sitka spruce trees, alders, mountain ash, Devil's Club, and skunk cabbage. This park is paradise to me. In August, the pink salmon (“humpies”) fight tides, river current, and each other to reach prime spawning beds. I can sense them, and I positively can't miss Ursus arctos sitkensis, the Baranof Island brown bear, as she rumbles around my park, fishing and chomping on blueberries. A genetic oddity, she's actually more closely related to the polar bear than to other brown bears. The Russian Bishop's House is our second park unit, one of only four buildings remaining from the Russian colonial era in the Western Hemisphere. 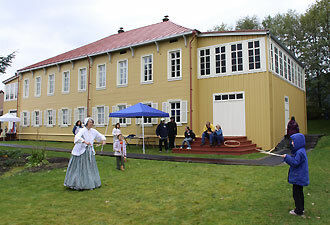 Located in the heart of Sitka about a half-mile from the visitor center, the “RBH” is restored to its original 1843 condition. It features many original furnishings and a garden planted after the Russian practice—rows and rows (did I mention rows?) of potatoes, carrots, and leafy vegetables. Hey! Look who's loafing under the kale! That's my cousin, Mario. Maybe he'll give you a tour!